The recipes I gravitate toward tickle my curiosity, and it is often that a recipe sparks my attention when I least expect it. For example, while I was making the long, wintery drive to my parents’ home this past holiday vacation, I was listening to the many downloaded podcast episodes of the cooking shows I enjoy: The Splendid Table, Bon Appètit, Christopher Kimball’s Milk Street Radio, and it was on one of the last episodes with Lynne Rosetto Kasper that the discussion turned to vegetarian options for the holidays. Her guest was from America’s Test Kitchen which, as fans of theirs will attest, share recipes after much testing takes place, thus the name. 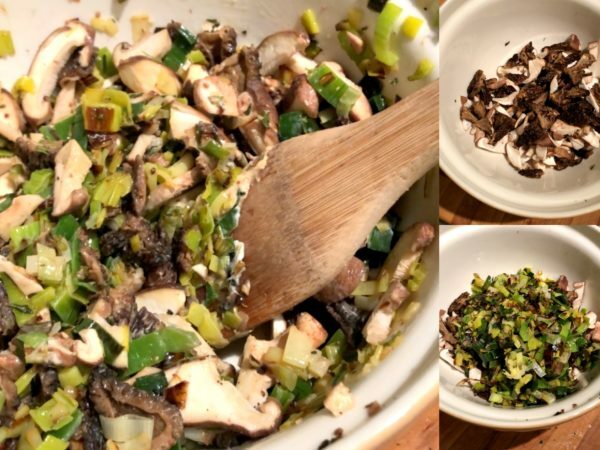 While I am not a vegetarian, I was intrigued as the recipes all perked up my tastebuds, and I took note to download the recipes when I reached my destination. 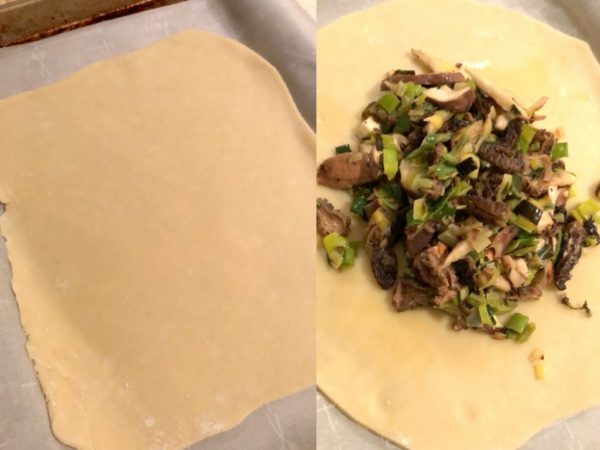 One of the recipes was the Mushroom and Leek Galette, and after a few tweaks of my own to accommodate for my preferences and portion sizes, I found it to be scrumptious. Upon my way home from my parents, my mom packed up my cooler as is our modus operandi with canned goods, leftovers from the Christmas dinner and morels that had been found earlier in the year (they had been freeze-dried). 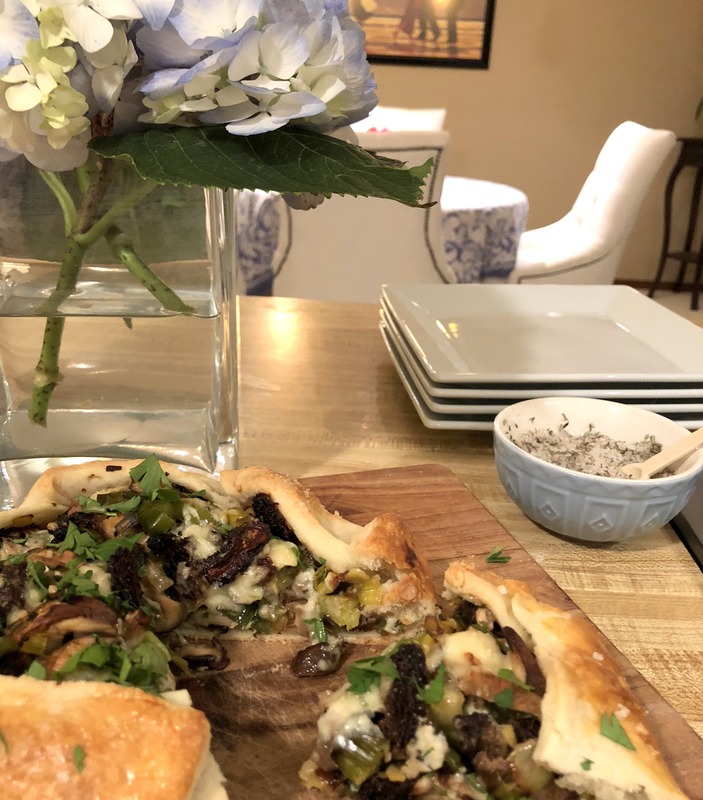 I knew immediately what I wanted to do with the morel mushrooms – the Mushroom and Leek Galette I had heard on my drive! I have recently been receiving a few emails about how to cook delicious meals during the busy work week. And in fact, I will address this in more detail in tomorrow’s episode of the podcast (episode #191), but I will say knowing you have a much-anticipated recipe to enjoy at the end of a long work day is a beautiful motivator to finish the day well. Such was the case with this particular recipe. However, I split it into two days as I note in the instructions below. While the pastry can be made on the same day as the filling, it does take more time. 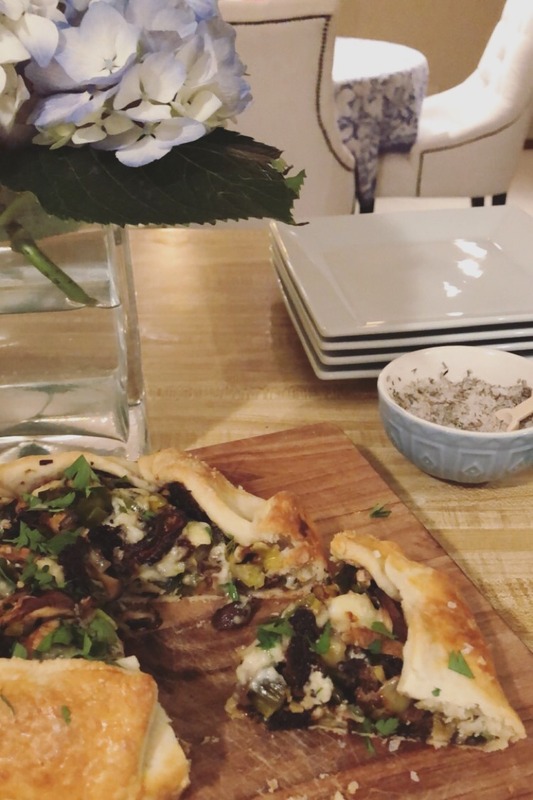 What I chose to do was make the pastry the day before, keep it in the refrigerator (it can be made up to 2 days in advance, I would stretch that to 3-4 if I had to without a worry) and rolled it out the next day to finish the tart. 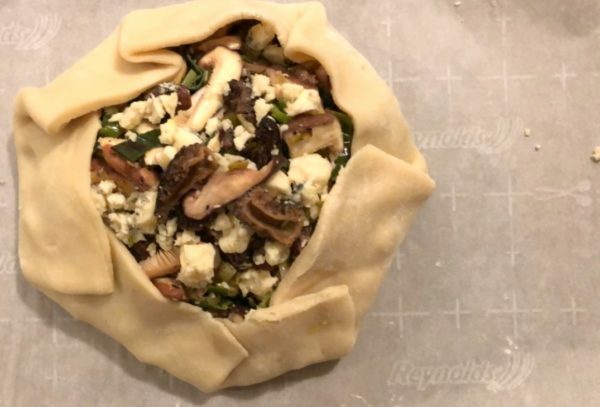 The second day preparations are simple, as you can quickly make the filling (which takes about 10-15 minutes), roll out the pastry, assemble and place in the oven in a total of 20 minutes, bake for 30-35 and voilà, you have dinner. I included as many images from the progression of the recipe while I made it below, and you can now see the entire “story” (videos as well) on Instagram in my Highlights on my profile page – click “Mush. Galette” (@thesimplyluxuriouslife). 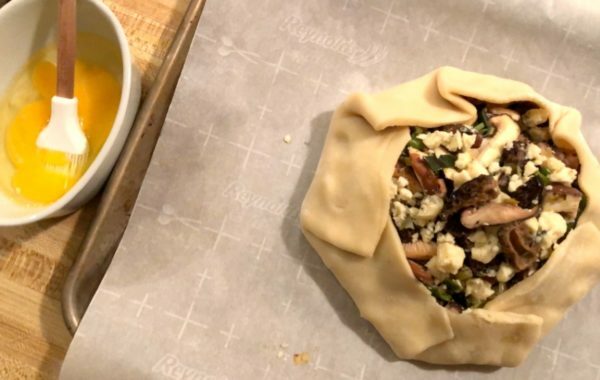 The galette truly is a meal in and of itself. Simple and delicious. Enjoy! Using a food processor, mixing bowl and dough cutter (or a fork), add the flour (both), sugar and salt into the processor or bowl. Pulse until combined. Then add the cubed butter, pulse until crumb-like. Mix together in a small bowl the vinegar and water. Add the water/vinegar mixture gradually (you may add less or more than what is in the recipe depending upon the humidity in your area). Pulse until the dough is combined, but there is still some flour remaining - in other words, it shouldn't be a smooth ball of dough (if that is the case, you've pulsed to much and added too much water). Place dough on a large piece of plastic wrap, roll into a ball and flatten into a disc. Wrap tightly in plastic wrap and place in the refrigerator for 45 minutes. Remove the chilled dough and place on a floured surface. Roll out into a rectangle until dough is about 1/8 inch thick. Fold into thirds (similar to an envelope) until you have three layers of dough folded on top of each other. Turn the dough 90 degrees and roll out into a rectangle (the same as you did initially). Fold into thirds and then fold in half to form a square. Press the square gently until it is seals and combined. Wrap in plastic wrap and place in the refrigerator for 45 minutes or up to two days. I chose to make the dough the day before I made the galette to save myself time during the work week. Place the oven rack to low/medium. Place a baking stone in the oven if you will be using one. Preheat the oven to 400 degrees Fahrenheit. Remove the dough from the refrigerator, and set on a counter to reach room temperature while you are preparing the filling. 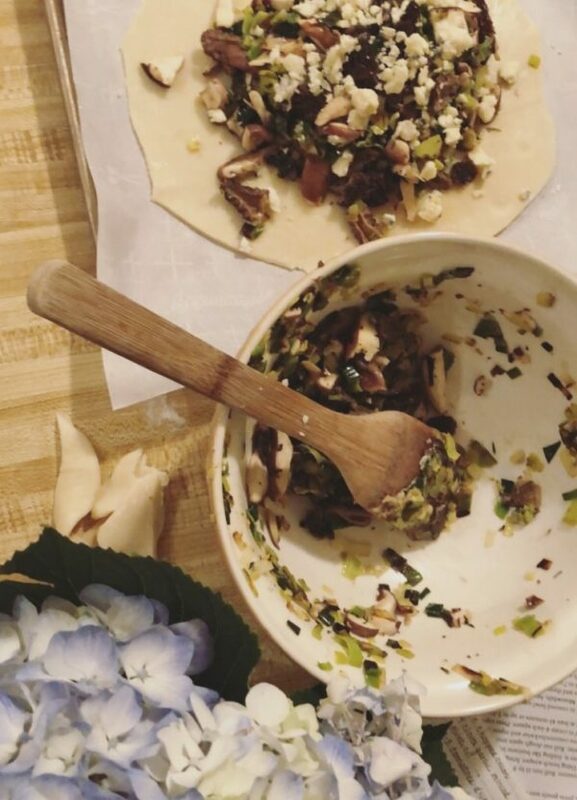 Prepare the mushrooms, slice and stem, and place in a bowl. Set aside. Heat a 12" skillet to medium, add 2 tablespoons of olive oil. Add the leeks and thyme, cover, stirring occasionally, until leeks are tender and beginning to brown, about 5-7 minutes. 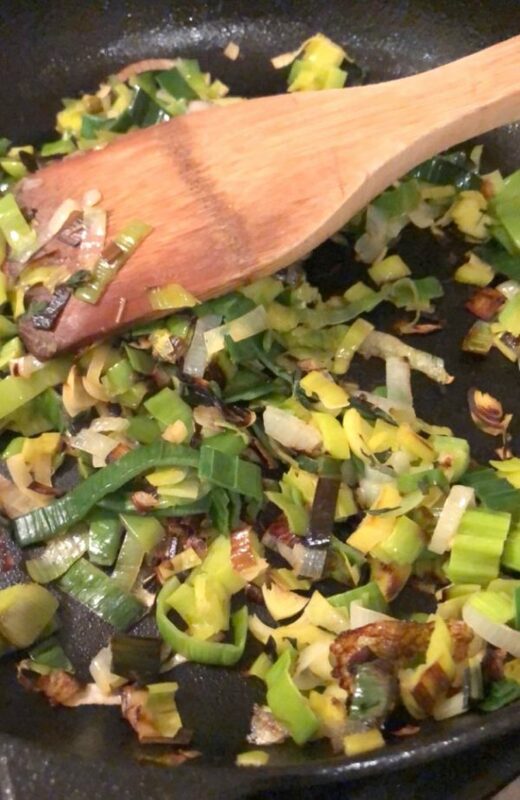 Add the leek/thyme mixture to the bowl with mushrooms. Add the crême fraîche and Dijon mustard, and salt and pepper to season. Mix together. Set aside. Roll out the dough onto a floured surface, until 1/8 inch thick. Place on the prepared baking sheet, lined with parchment paper. Cut the square edges to create a circle. Brush the dough with 1 teaspoon olive oil. Place half of the filling into the center of the dough, leaving 1 1/2 -2 inches free as that will be the edge. Then add half of the Gorgonzola. Follow with the remaining filling and the remaining Gorgonzola. Drizzle with 1 teaspoon olive oil. Fold the edges of the dough onto the filling, overlapping as you make your way around the galette. Brush with the beaten egg, and sprinkle evening with flaky sea salt. Reduce the oven to 375 and immediately place the galette in the oven. Set the timer for 30-35 minutes, and rotate once during this time. Remove from the oven when the crust is brown to your liking as well as the top of the filling. Place on a baking rack to cool for 10 minutes. Sprinkle with minced parsley, and slice into wedges. Enjoy! This is going on my ‘must try’ list. Thank you for loving to cook, and sharing! Will certainly try this, as I just made your French Onion Soup tonight for a birthday celebration dinner & the flavor was perfect! It was so simple & relaxing to make. Loved your tip to use croutons on top of the soup instead of whole slices of bread. Was much less sloppy to eat in front of others at the table than the traditional way! Thank you, Shannon for the quality recipe & instructions. One of my goals for 2018 is to eat less meat. Thank you for sharing this recipe which I hope to try soon. Thanks for this recipe Shannon. I just tried it today and it was unique and delicious! You are a better woman than I, since I just used puff pastry instead of making the crust from scratch, and it turned out great. I’m sure the original recipe is best, but it’s often nice to save a few minutes in the kitchen when you’re hungry 😄. 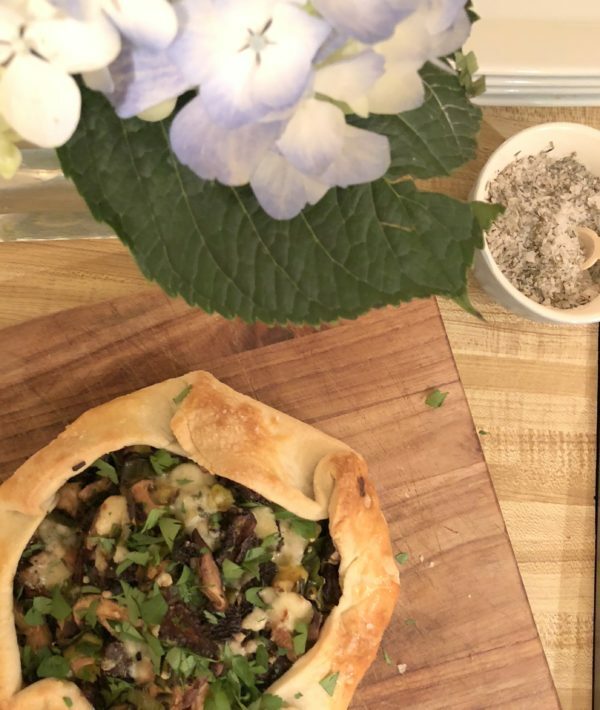 I loved the French influence in this dish – thanks again! So happy to hear you enjoyed it! Absolutely use a puff pastry! That is what they are for – such wonderful time savers. 🙂 Thank you for sharing your experience. Thank you for this dinner idea. I made it tonight and I would suggest cooking the mushrooms to release the moisture first. It made my galett a bit soggy.